Free Shipping Included! 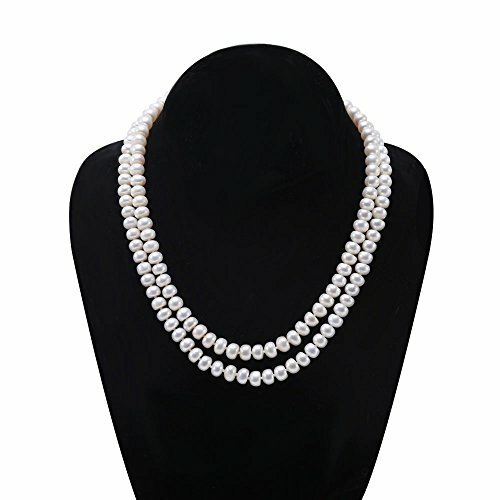 JYX Classic Double-row Flatly Round White Freshwater Cultured Pearl Necklace (7mm) by JYX Pearl at The Bling Tree. MPN: FNM566. Hurry! Limited time offer. Offer valid only while supplies last. Description *Classic two-strand pearl necklace made with 7mm flatly round freshswater pearls. *The wearing length of this necklace is 17-18 inches. *Classic two-strand pearl necklace made with 7mm flatly round freshswater pearls. *The wearing length of this necklace is 17-18 inches. We also use double silk threaded, individually hand knotted bewteeen each pearl. The wearing length of this necklace is 17-18 inches. We also use double silk threaded, individually hand knotted bewteeen each pearl. All the pearls have very good luster, high quality and shiny color. Classic and simple design, this necklace is your optimal choice. We have several major pearl cultivation farms in China, our product categories vary from all styles of freshwater and saltwater pearl jewelries to dozens of semi-gemstone varieties.you are welcome to order in bulks and great offers will be provided.